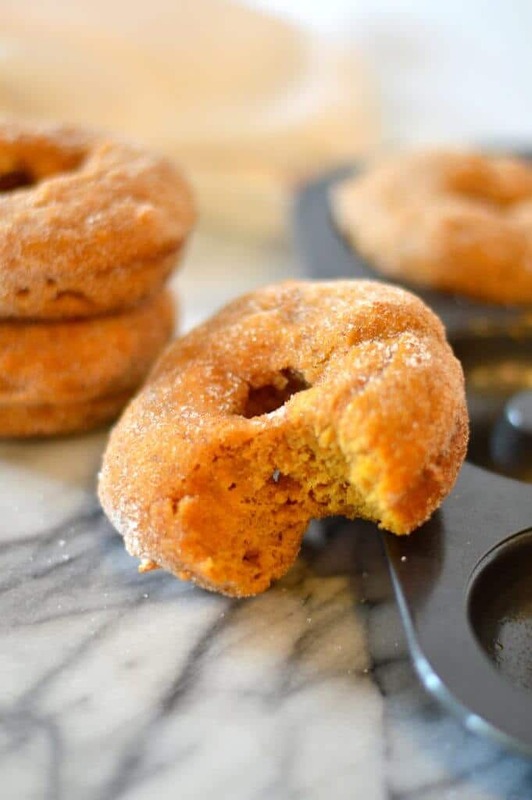 Healthier Baked Pumpkin Donuts are a delicious way to enjoy donuts without frying. This recipe uses no butter or oil, so it’s perfect as a breakfast treat! I had a hankering for a pumpkin donut after we made our annual trip to the apple orchards a few weekends ago. They make these crazy delicious homemade/freshly fried apple cider donuts that are perfectly dusted with cinnamon sugar. We polished off two each and went on our merry way to pick apples and drink hot cider. Sometimes when I have a donut or two, I get the donut fever because I forget how delicious donuts are. Okay, I always know how delicious donuts are, I just try to steer clear of them because we can’t exactly call them “health food”. The last time I had a really delicious donut before the apple cider ones from the orchard was in February when we went up to Boston. I got a honey dip donut from Kane’s Donuts and totally fell in love with the organic honey glaze. Sometimes a donut is not about its toppings as much as it is about a fabulous dough, and you can definitely tell when the donuts are plain and glazed. 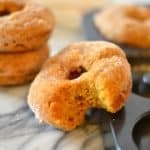 So today, I bring to you healthier baked pumpkin donuts – deliciously moist and flavorful without all the extra added calories by frying or using butter or oil in the batter. There’s enough pumpkin and pumpkin spice in the batter for you to know these are deliberately pumpkin donuts and not just regular donuts tinted orange for the upcoming autumnal holidays. My donut pan is likely one of the most neglected items in my kitchen, which is a shame because I always love making a fresh batch at home. My first batch was a baked chocolate variety with a thick and chocolaty frosting and a big handful of sprinkles. 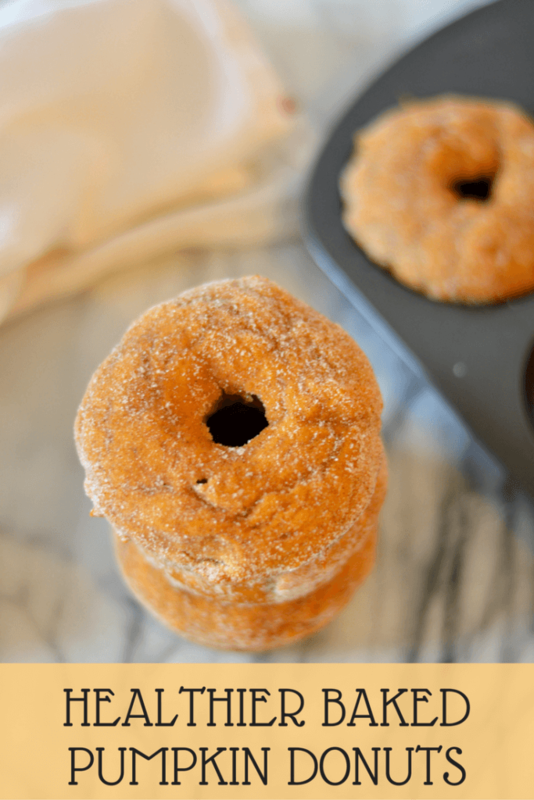 If you’re in the mood for a donut but don’t feel like busting out the dutch oven to fry them, grab a donut pan and get to baking these beauties. I promise you won’t regret it! What’s the best donut you’ve ever eaten and where did you get it? Preheat oven to 350F and spray 12 donut cavities with nonstick cooking spray. Add pumpkin puree, greek yogurt, eggs, sugar and honey. Mix well until lumps disappear. Evenly distribute the batter among the 12 donut cavities. Bake for approximately 15 minutes, or until an inserted toothpick comes out clean. Allow donuts to cool briefly, then remove donuts and transfer to a cooling rack. If desired, mix together cinnamon and sugar into a small bag. Place donut inside the bag and shake to coat the donut. This post contains Amazon affiliate links, but are (as always) products I love and recommend. These donuts look heavenly! For some crazy reason I don’t own a donut pan – but I totally need to nab one ASAP so that I can get on the healthy donut baking train! Thanks Nicole!! You definitely need a donut pan!! !